There we were in southern Italy. We were camped near a town called Cassino. We had just got off of a long march and our legs were sore and our bodies were tired. Just down the road from our camp was a church. About an hour after we set up camp, the Priest came and invited us to service. Nearly half of our platoon followed the Priest back to his church. I was sitting there among the rest of the guys from my squad listening to the prayers being read out loud when I remembered something that the priest from my church back home had taught me. He told me to always carry a deck of cards. I reached in my left breast pocket for my deck of playing cards. Just as I was laying them out, a sergeant walked by and saw what I was doing. I reluctantly put my cards away. After the service was over, we all walked back to camp. Upon arrival I was told to report to our commanding officer. “Sir, you wanted to see me?” I asked, not knowing what this was all about. I began to flip each card over to explain. “You see the ace reminds me of the one true God. The deuce reminds me of the two parts of the Bible, the Old Testament and the New Testament. The trey or three is the trinity; the Father, the Son and the Holy Ghost. The four, well that’s the four Gospels of St. Matthew, St. Mark, St. Luke and St. John. When I look at the five, it reminds me of the two groups of five virgins who trimmed their lamps for a wedding. Five of them were wise and saved enough oil and were admitted, while the other five were foolish and used all their oil and were shut out. The six - it reminds me that God created the Earth in six days. And the seven reminds me that he rested on the seventh day. The eight reminds me of the story of Noah and the great flood. You see God had saved eight people including Noah, his wife, their three sons and their wives. The nine, well Jesus cleansed ten lepers but nine of them never even thanked him. As I flipped over the King, I could see the curiosity in the Major’s eyes. The Queen is the blessed Virgin Mary. There are 365 spots, which is the number of days in a year. There are 52 cards which equals the number of weeks in a year. Each deck holds thirteen tricks, the number of weeks in a quarter of a year. There are four suits and four weeks in a month. The twelve face cards are the number of months in a year. The Major stood up and gathered up my cards. With a smile of approval, he hands me my deck of cards. “Thank you Private.” says the Major. In 1948, two years after the end of World War II, country musician T. Texas Tyler wrote a recitation song called “The Deck of Cards.” The song was based on a similar folk story in which the earliest known reference dates back to April 20, 1762. The story was found in an account book belonging to a British farmer’s wife named Mary Bacon. Forty-three years later, America found itself in another war; this time in the Persian Gulf. In 1991, Whispering Bill Anderson took the classic song, re-wrote it to bring it to the center of attention to those serving in the Persian Gulf. “I have done the old version... The message of ‘Deck of Cards’ is so timeless. In fact, the message of that song has been traced back to the 1700s.” shares Bill Anderson. “When T. Texas Tyler turned it into a song he had the setting in the Second World War. He had the first big hit on it back in the late ‘40’s. That’s the way it had been done up until I did it. Tex Ritter had done it that way. Wink Martindale had done it that way. It was a sweltering hot Sunday morning in the Saudi Arabian desert. And a young soldier sat alone in his tent, deep in thought. A picture of his wife and children back home in the United States, rested on a table nearby. His mind began to wander across the miles back to other Sunday mornings that seemed so long ago. Now and so far away, he thought of home. And he knew that when this day dawned in America. His family would go to church to pray for his well-being and his safe return. The young soldier reached into his bag and he took out a deck of playing cards. "You gonna get up a game?" "No," the soldier replied "I'm gonna spend a little quiet time with the Lord"
When I look at the Trey, I think of the Father, the Son and the Holy Ghost. When I see the Four, I'm reminded of the four Evangelists who preached the Gospel. There was Matthew, Mark, Luke and John. The Seven reminds me that on the seventh day, God rested from His great work. When I see the Eight, I think of the eight righteous persons God saved when He destroyed this old world. There was Noah, his wife, their three sons and their wives. And when I look at the Nine, I think of the lepers our Saviour cleansed; and nine out of the ten, didn't even thank Him. And when I see the Ten, I think of the Ten Commandments God handed down to Moses on the table of stone. When I look at the King, It reminds me that there is but one King of Heaven - God Almighty. The Queen reminds me of the Blessed Virgin Mary Queen of Heaven and the Jack or Knave is the Devil. I find 365, the number of days in a year there's 52 cards, the number of weeks in a year. There's 4 suits, the number of weeks in a month. There's 12 picture cards, the number of months in a year. There's 13 tricks, the number of weeks in a quarter. So you see, my friend, this deck of cards serves me as a Bible, as an Almanac and as a Prayer Book. And friends, this story is true, I know because I know that soldier. 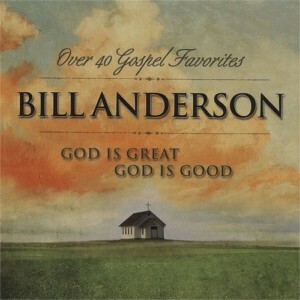 Bill originally released his version of this song on his 1991 album, The Best of Bill Anderson. However, Bill includes this ever popular song on his new two-disc album called God Is Great God Is Good. Just released this spring, Bill’s new album features forty beautiful Gospel songs; including several classics like “Blessed Assurance,” “Just A Closer Walk With Thee,” “Peace In The Valley,” “Precious Memories,” “In The Garden,” “I Saw The Light,” “Softly & Tenderly,” and “I Love To Tell The Story” to name a few. Each of the songs included on this two-disc album were recorded over a period that spanned nearly forty years. This album includes the original recordings that Bill previously released at some point in his career. To the music enthusiast, one can see that many of these songs were written by some of Bill Anderson’s most treasured friends. Including many whom he has performed with on the Grand Ole Opry. It’s as if he is paying tribute to their memories. Bill’s true artistic style comes out in this album. Each song is performed in the respect that it was written in. Out of the forty-one songs contained on this beautiful album, there are eight songs that will hit our list of Top Songs of 2015. All eight of these songs have earned a nomination for the Spirit Award’s Song of The Year Award. The entire album has also earned the nomination for Album of The Year Award. The first of these songs is “Touch Of The Master’s Hand.” Performed as a recitation, the plot of the song speaks about a violin that an auctioneer is trying to sell at an auction. The second noteworthy song to hit our list is “Friends.” This is another beautiful song with a narration that speaks about how important friends are. One of the most noticeable songs on this album is “Ole Doc Brown.” In this song, Bill tells the story of a country Doctor that is told to a beautiful instrumental of “Closer Walk With Thee.” Many entertainers have recorded this song over the years. One of my favorite songs on this entire two-disc album is “The Farmer & The Lord.” In this narrative song, Bill tells us the story of a farmer and his conversation with the Lord. What brings this song to the foreground for me is the simplicity of the story mixed with humble melody. Farmers, especially those of yesterday, often relied on the Lord to provide sun and rain for their crops and livestock. Hours upon hours in tractors working God’s green earth often brought a farmer closer to God. Of course “Deck of Cards” also hit our list of Top Songs of 2015 as it hit our Songs For Soldiers list as well. Bill pays tribute to his beloved mother in his self penned song “Mama Sang A Song.” In this song, Bill gives the glimpse into his childhood in this heart warming song. “Mother growing up, her father being a preacher and all, she was heavily influenced by that kind of music and passed it on to me.” shares Bill. The entire two-disc album closes out with a beautiful Christmas song called “Still Believing In Christmas.” Performed with a gentle instrumental of “Silent Night” that features an artistic touch added by a choir. In this song, Bill voices his assessment of how Christmas has changed from the magical holiday he knew as a child to the hasty ungrateful holiday it has become today. Most Gospel albums often sound mundane and monotonous as entertainers often record the same Gospel songs as the next entertainer. This is not the case with this album. This one makes for the perfect album to permanently reside in your car’s cd player as Bill gives us a great collection of Gospel songs that is both entertaining and enlightening. The album takes us on a journey through time as it prompts long forgotten memories while you listen to the classic hymns. The ‘newer’ songs capture your interest. But it’s the narrative songs that brings your imagination to life.